I Heart Huckabees is one of those great films that allows the viewer to enjoy and have fun with what he or she is seeing, and potentially allows one to become a more enlightened person after seeing it. 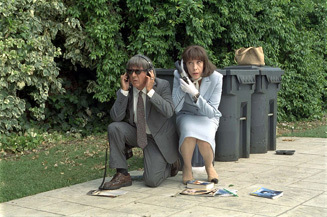 I Heart Huckabees is one of the most ‘different' comedies I have ever experienced. This movie is completely zany - just look at the plot. The story revolves around one Albert Markovski (Jason Schwartzman), an environmentalist who is trying to save the world's remaining green spaces. He plants trees in parking lots and mass produces his poems to bring people into his fold to protest against urban sprawl. Albert is an ineffectual mess who is looking for more from life than what the world has presented to him so far. He visits two ‘existential detectives', Bernard and Vivian (Lily Tomlin & Dustin Hoffman) to help figure out why a series of coincidences keep happening to him. As these detectives begin to investigate him, the outer portions of Albert's life are exposed. Albert is being pushed out of his Open Spaces Coalition by Brad Stand (Jude Law), and while looking great on the outside, Brad has his own set of problems, and hires Bernard and Vivian himself. Brad is on the rise at retail chain Huckabees, and is living with Dawn Campbell (Naomi Watts) who is the Huckabees ‘it' girl. We also get to know Tommy Corn (Mark Wahlberg) who is also a client of the existential detectives, and is a good match for Albert as Tommy is completely opposed to petroleum production. The crazed plot also includes another existential detective Catherine (Isabelle Huppert) who has seemingly slipped to the dark side of this kind of detecting, and plots to save Albert and Tommy herself. Confused yet? Don't be. Just go and have fun. Under the great direction of David O. Russell, the film is able to contain its frenetic pace (much like Russell's terrific Flirting With Disaster), keeping the audience in tune with what's going on, and serving up laughs along the way. The performances here are perfectly over-the-top, from Dustin Hoffman's controlled-crazy performance (he looks like what one of The Beatles would have looked like if they had kept the outfits from the mid-'60s). Tomlin is always perfect in this sort of thing, strong and always straight-ahead – definitely no winks toward the audience in this one. Tomlin played the flip-side of the character in Russell's perfect Flirting With Disaster, and is certainly at the top of her game this time out as well. Jason Schwartzman is perfect for his part, as it's almost like he rode his bike from Rushmore, aged ten years and showed up on the set. He brings a lost-puppy sort of thing to Huckabees, and they couldn't have chosen better. To reflect Hoffman's Beatle-like image in the movie, Schwartzman looks like a Beatle circa 1970. Maybe the best performance here, though, is surprisingly from Mark Wahlberg. His Tommy Corn is not essential to the plot, but not unnecessary either. I have always thought of Marky Mark as an idiot, but he pulls off this role quite well, and he is a service to the film. Other great appearances in this film include Tippi Hedren, Jean Smart and Talia Shire, along with the rest of the great supporting cast. Box office wise, Huckabees is already off to a great start in limited release, recording one of the biggest venue averages ever for a non-animated, non-Imax film. Can Huckabees play to a wide audience? Probably not, but it will fill a niche for those discerning moviegoers looking for more than the usual brainless type of Hollywood film. The cast has a pedigree like no other, and the writing is superlative, which sadly eliminates most of the under-21 set from seeing this film. I Heart Huckabees is a great film, one not to be missed, especially if you don't mind thinking a little. Heck, even if you don't like thinking, you might still enjoy Huckabees.